I was at Bass Pro Shops this past weekend and saw a Savage 17 WSM . I looked at the gun and really liked the weight at only 4.5 pounds. I brought it home after the two hour ride home unboxed and read instructions. I was oiling the gun to put in safe and noticed the barrel. The barrel on the right side has a gap that a quarter will fit into and go into stock. Left side of barrel is toughing the stock. What's yalls opinion. Would you send back to savage or just buy a Boyds stock . I know the wooden stock will add weight. I tried to call Savage today but guess they are closed for president day. I figure where it's so off the gun will be inaccurate correct. Please give me yalls advise. The plastic stocks are stupid flexible. Before I bought a Boyd for my BMag I filled the honeycomb structure with Marinetex epoxy and glass bedded the first 2" or so of the barrel where the three depressions are. Then I used a dremel tool to be sure the barrel was free floated back to the barrel rings. It is a now a near minute of angle shooter. If the epoxy falls out I'll just buy a Boyd. i only put 5 or 6 shells in the magazine at a time. I also bought an extra magazine and sight it in every time I start on a new box of ammo. Mine seems to like American Eagle and Hornady but I suspect variance in ammo lots. Super cool rimfire. I have one by Ruger. 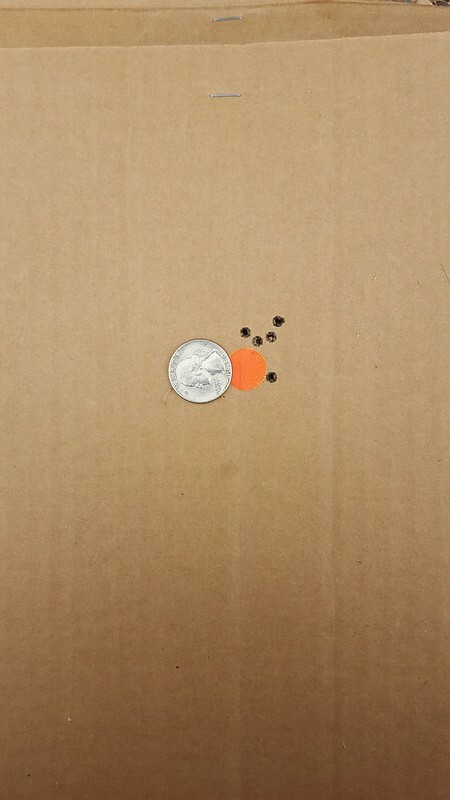 Fun and cheap to shoot. I've dropped a bobcat and a mangy yote so far with it. Mine touches and its accurate enough for the shooting i'm doing and i am by no means a great shot either. I've considered glass bedding and working the stock to keep from touching but just haven't gotten around to it. this was at roughly 100yd, resting off the hood of my car. It's close enough for me, maybe not for others. Hope your rifle works out for you, I've really enjoyed mine and its a fun and neat round. Cookie1125, there's nothing wrong with that group. Peanut, I would shoot for group before I did anything. Based on group, if its bad. I would take the stock off and check how it sits, bolt hole could be off. Barrels move a little when gun is fired. You could sand down the left side where its touching just enough to give it clearance. You can also fill the other side temporarily with card board shims. Shoot for group again. If your group is improved, glass bed it. Or you can buy a new stock. But first I would check with the dealer or manufacture to see if they will replace it for free. Thanks for all the info. I called Savage on tuesday and explained the problem. Savage customer service is great. They told me that they would send me a new stock in the mail. They also said after that if it was not fixed just call them and send to the factory. Thanks again for all the great advice. I got my new stock in mail today from Savage and bolted it on tonight. The new stock is worse. I'm gonna shoot it then try the cardboard to see if group is tighter. Then I'm gonna take to my gun smith. I'm just very disappointed in Savage. I don't know what their quality control was looking at on this gun when it left. That is an easy fix. I was going to post earlier, but by the time I saw it, you already sent it back. I figured sending it back was a waste of time. I too like the light stocks. Every laminate I put on I regret (too heavy). The only reason I did some was to get a shorter LOP (which I need). The Ruger guns with the inserts for a custom fit fixed that. Now for your problem, forget sending the stock back to get the same or worse. Take the action out of the stock, but before you do, note from what point forward the stock is too close to the barrel. Take a retractable narrow razor knife and holding it at a 90 degree angle NOT angled, scrape the high spot down. The plastic will come off in curls, and is much faster than sanding. Remove the interference on that side, and you will be good to go.